Our unusually warm September has been breaking temperature records especially in the south of England. 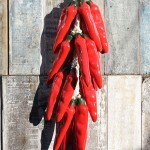 Here at Caoba we’ve been generating our own heat, chile heat. 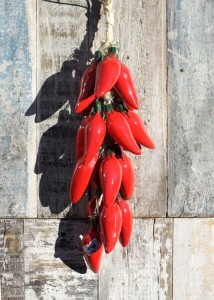 Latin American in origin, the chile pepper (capsicum) has spread its fascination across the world. In culinary terms they are both challenging and highly addictive. As ceramic decorations they brighten up any northern European kitchen with their fiery red, yellow and green glazes. Is it chile the or chili? The former is largely Spanish in usage, the latter American English. 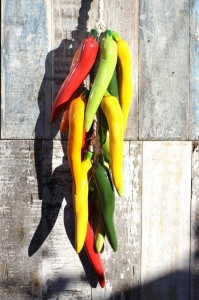 One suggested way to distinguish between the two is to use chile for the plants and fruit and chili for the stew. 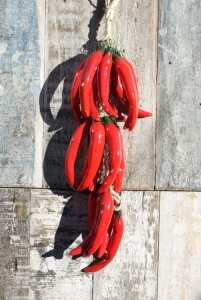 There are hundreds of chile varieties and as the fiery fruit’s use has spread across continents so have these varieties and different names proliferated. 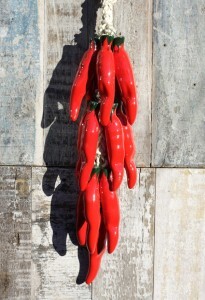 The relative heat of a chile is measured on the Scoville Scale, named for its creator Wilbur Scoville. Chile Jalapeño, the one familiar to most of us. Dried and smoked it becomes the chipotle chile used in salsas and chilis. It has a heat range of 1,000-20,000 Scoville units. 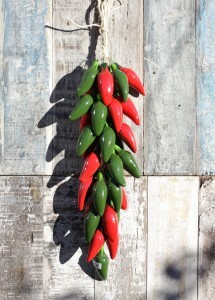 The Jalapeño is usually eaten when still unripe i.e. green, although our ceramic versions are resplendent in a very ripe, bright red. With a nod to Wikipedia I can tell you that Jalapeño pepper is the state chile for Texas and has in the past been taken into space. It doesn’t report whether or not they returned. 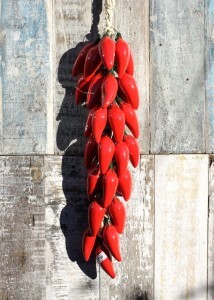 The Serrano chile, originally from the mountainous regions of Puebla and Hildago (Sierra = Mountain in Spanish). They are usually hotter than a Jalapeño with a Scoville range of 10,000-25,000 units. 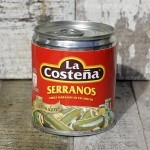 The Serrano is most often used in a Pico de gallo (fresh, chopped tomatoes, onion, coriander and chiles) and as such, eaten raw. In English, the Hungarian Wax chile, is widely grown across eastern Europe and in its red, ripened form used a lot in Hungarian cooking. It has a wide range of 1,000-15,000 Scoville units. i.e. mild to moderate heat. This mild chile (just 500-700 Scoville units) is known by so many different names you have to wonder whether it has something to hide. This entry was posted in Mexican Ceramics, Recipes, Useful Info and tagged ceramics, chiles, chilli on September 23, 2016 by admin.